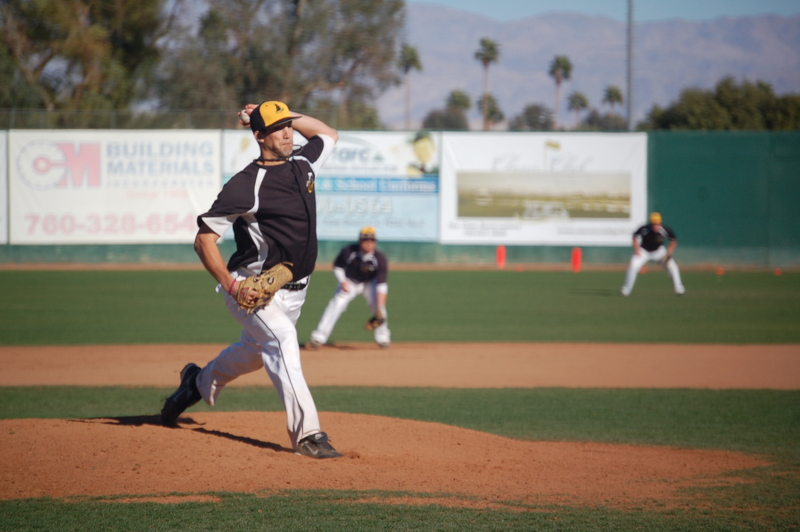 Palm Springs, CA-Feb. 2, 2011 – In game one of Wednesdays doubleheader, The Canada A’s faced off against the Palm Springs Chill. It was a high scoring affair but the A’s prevailed 10-6. The A’s are now 6-3 and are on a five game winning streak while the Chill fall to 2-6-1. While both teams had effective offensive outputs, the story of the game was Canada A’s pitcher Matt Walker. 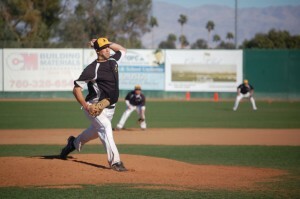 Walker went the distance and became the first pitcher to throw a complete game this season. The A’s trailed 5-1 at the end of four when the bats finally came to life. They scored six runs in the top of the fifth inning to take a 7-5 lead. Brett Flowers put the game on ice with a two RBI single in the 8th inning giving the A’s a 9-6 lead. That lead would prove too much for the Chill to overcome. Game two was a pitchers delight between the Coachella Valley Snowbirds and the Palm Desert Coyotes with the Coyotes squeaking out a 4-3 victory in dramatic fashion. The Coyotes up their record to 5-4 and the Snowbirds are now 4-4-1. The Coyotes put up two runs in the bottom the first to go up 2-0. That lead held until the 6th inning when the Snowbirds tied the ball game up at two, a score that held until the 9th inning. The Snowbirds took the lead in the top of the 9th after Drew Boyd singled in Jonathen Johnston. Johnston stole second and third base to get himself in scoring position. The Coyotes answered in the bottom of the ninth when David Holcombe brought in the tying run from third on a fielders choice. Two batters later, Clint Stottlemyre hit a sacrifice fly to short right field and Jordan Drake tagged up from third and scored the winning run on a close play at the plate.